The World’s Longest Group Motorcycle Benefit took place beginning July 1 through the end of July, 2009. 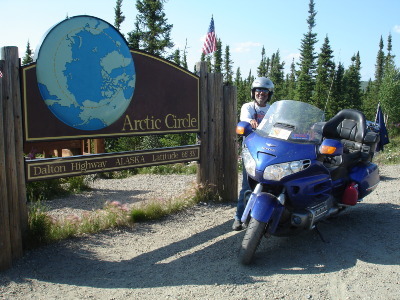 Mike Tuccelli, the charity organizer wrote to thank the Ride-On staff - "I had two punctures on my front tire on the Haul Road but made it back to Fairbanks without problems. A biker, Jenny, didn't have Ride-On and she had a similar puncture at Yukon River bridge and promptly had a flat! Again, thank you for your sponsorship. We look forward to your sponsoring us again in 2010 "
Last year, 16 bikers, including several retired law enforcement officers, raised thousands of dollars to benefit deaf and/or blind babies by selecting SKI-HI as its beneficiary. SKI-HI is a non-profit organization, the only one of its kind in the world that provides hope and a plan of action to parents of deaf babies throughout the United States and Canada, with outreach programs in other countries in the world. 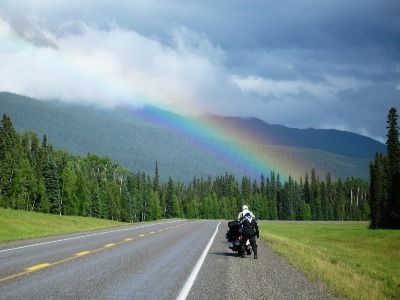 Past rides have ranged from 9,000 to 14,000 miles, taking in Key West, Florida to New Brunswick, Canada, then to Prudhoe Bay, Alaska, down to Mexico and back to Florida. Bikers are sponsored by their families, friends, and business associates from 1/10 cent per mile upwards to $10 per mile, with 100% of the funds sent to SKI-HI (see www.SKIHI.org).